It’s likely you are reading this article because either you or a loved one has a problem with alcohol and/or drugs. And, you also know that the substance abuse is causing too much pain, hurt, and down right suffering to the one who is using, and to his or her loved ones. Of course, the level of pain and suffering varies from day to day, and also depends on the extent of the problem. While the level of hurt and destruction to life will vary from individual to individual, the solution is still the same: The need to change your world; to get out of the cycle of addiction. If you have tried to stop drinking, tried to stop your drug abuse, and find that you can’t, rehab is for you. At a rehabilitation center, you will receive professional help, and will be taught the knowledge and skills you need to break free from the bonds of addiction. Of course, you want to choose which will be the best drug and alcohol rehab center for you. Inpatient rehabs are also referred to as residential treatment centers. This choice may be best for persons who are moderately to severely affected by excessive consumption of alcohol and/or another drug and abuse. This type of treatment costs more compared to the outpatient treatment because residential costs and other expenses are included. Inpatient rehab provides an environment away from many triggers, e.g., people, places, and things, and an environment of continuous care. * Are you using alcohol on a daily basis and are not able to remain alcohol free for 24 hours? If “Yes,” inpatient treatment is indicated. * Do you experience severe withdrawal symptoms if you try to abstain and stop drinking, e.g., convulsions, seizures, blackouts, delirium tremens (DTs) (body tremors, confusion, disorientation, stupor, hallucinations)? If yes, inpatient is indicated with detox. Alcohol withdrawal can be fatal is not managed medically. * Are you unemployed? If yes, you may have too much free time on your hands, putting you at higher risk for spending time the old way, i.e., going back to using your free time for drinking. Inpatient rehab may be most beneficial. With an outpatient program, people visit the treatment center on a periodic basis for counseling and treatment (for example, 3x / week for 10 weeks). This type of treatment is less costly compared to the inpatient treatment because the client does not incur residential costs. If you have decided on a residential treatment center, no matter what part of the world you are looking at for a quality rehab center, you will find no other like Drug & Alcohol Rehab Asia. While you might find a comparable treatment program, when it comes to setting and facilities, we are absolutely unique. Our accommodations are truly luxurious when it comes to comparing us to other rehabs, or when just looking at us and no one else. 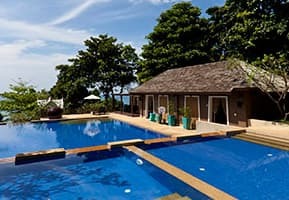 From our beautiful villas, to our stunning pool, to our clients’ lounge and amenities, to our spectacular tropical island location, Drug & Alcohol Rehab Asia stands alone. Of course, you can see for yourself. Browse around our website, and browse around the websites of other rehab centers. Even the top rehabs in the U.S. or the U.K. — in terms of facilities– simply don’t compare. The 12-Step model is the predominate paradigm of rehab programs in the United States, the UK, and other countries. This is, however, changing as more and more research is being done on the effectiveness of 12-step program vs. non 12-step programs, e.g., Cognitive Behavioral Therapy (CBT) based programs. The 12-Step is based on, and permeated by, the philosophy of Alcoholics Anonymous (AA), and thus the 12 steps used in AA. With the 12 step philosophy, recovery comes through group affiliation with other recovering persons, and changing thought and behavior in accordance with the principles of the 12-steps of AA. The 12-Step model also adheres to the disease model of addiction. The disease model sees alcoholism as a medical illness which is chronic and progressive, with alcohol as the causal agent. The inability to control drinking behavior is seen as a symptom, and complete abstinence from alcohol consumption the only means of treatment. Controlled drinking is not possible, as alcoholics are physiologically unable to drink moderately due to the unique effect alcohol has on certain physiological processes. Many non 12-step programs do not see alcoholism as a disease, rather as a learned behavioral issue; however, for some, complete abstinence from alcohol is best. While the 12 Step Model / AA embraces the disease model, there is yet a moral dimension to having the disease and dealing with it—as seen in terminology and principles in the 12 steps, e.g., making amends, defects of character, personal inventory, confessing the nature of our wrongs, etc.. Twelve-step programs have a strong Christian religious tone that runs through them. Additionally, with that said, it is thought that recovery only comes with a spiritual awakening. Non 12-Step model programs are available, i.e., programs that do not use the 12 steps of AA as their foundation and as guiding principles. Also, many non 12-step programs do not see alcoholism as a disease, rather as a learned behavioral issue. Drug & Alcohol Rehab Asia is an effective alternative to 12-step programs, utilizing Cognitive Behavioral Therapy (CBT) as its primary therapeutic approach. While our program is a non-step program, we do not discourage recovering persons from seeking support in 12-step groups, e.g., Alcoholics Anonymous, upon their return home. Some find the social support of a 12-step group and the 12-step philosophy helpful for their recovery. In addition to a non 12-Step approach, Drug & Alcohol Rehab Asia incorporates a holistic approach to the treatment of alcoholism and drug and alcohol abuse. In addition to CBT therapy and Relapse Awareness education, we also incorporate into your program: personal training, art therapy, water workout in our pool, group sports, stress management, and outdoor pursuits and island excursions. One final topic to briefly discuss here: Detox. If you come to Drug & Alcohol Rehab Asia and are in need of a detox program, detoxing will be done at Bangkok Hospital-Trat. If it is determined you need more time than a 24-hour stay at the hospital (which is included in your DARA treatment package), you will be responsible for the additional fees directly to the hospital. Not everyone who needs rehab for alcohol or other drugs needs a detox program. You will be evaluated by specialists at the hospital to determine if detox is needed. Call us at +66 8 7140 7788, or email us at info@alcoholrehab.com or use the contact form.